Called Suntop in his youth for his sunny-bright hair, Sunstream is the gentle, enigmatic son of Cutter and Leetah. He has powerful magical abilities unrivaled by any other elf. His extremely sensitive “magic feeling” tells him when someone is using magic or if something has been manipulated by magic. He can send his spirit out of his body to commune with others on the spirit plane, and can astrally project his spirit-form into the physical world regardless of distance. His sending ability seems undampened by the magic-suppressing World of Two Moons that crippled the High Ones when they crashed there. Even so, as a youth, Sunstream’s expanding talents outpaced his ability to use them. When he detected the timeless psychic scream the High Ones made upon their disastrous arrival on the planet, he was unable to cope with it. Since then Savah, his loving mentor, has helped him hone and expand his magical powers. Indeed, she sees great promise in his abilities, prophesying that Sunstream’s sending ability will eventually become the link in a communion of all elves, the clear stream through which all his race can connect in this world and beyond. Even undeveloped, Sunstream’s powers have been the catalyst for more than one quest. Though his father is a Wolfrider, Sunstream’s twin sister Ember called the wolf-blood to her in the womb, putting her in line to become the next chief of the Wolfriders. As a child this didn’t bother Sunstream, whose attitude was simply “I’ll be what I’ll be.” Though well-adjusted and undoubtedly brave, standing up to Winnowill and channelling Timmain even as a small child, Sunstream wasn’t immune to teenage insecurities and felt the need to prove to Cutter that he can be a true Wolfrider. He failed when he tried to be something he wasn’t, and almost died as a result. When he let himself just be himself, however, his Wolfrider-bred courage and tenacity shone through and he banished the millennia-old magical sickness haunting the Holt. In doing so, he corrected the sins of his grandsire Bearclaw (who, thousands of years earlier, fueled the sickness with his mutual hatred of the human shaman Spirit Man and created the monster Madcoil which decimated the humans and elf tribes alike) and earned his adult tribe name. After his adventures with Dart’s band in the Forevergreen, Sunstream took up residence in the Palace of the High Ones. Along with the rest of the Sun Folk, he is training with the firstcomer Timmain to learn to manipulate the magical vessel currently disguised as a mountain in the Wolfriders’ Holt. As his abilities once again threatened to outpace his ability to use them, Sunstream entered suspended animation inside a preserver cocoon. More sensitive than most to the magical influence of the Palace, which is restoring those receptive immortal elves to the stature and abilities of the firstcomers, Sunstream’s body grew along with this powers and he now stands a full head taller than his parents. During his time in the cocoon, Suntream frequently sent his spirit out to explore. On one such journey, he encountered the spirit of the beautiful, timid Wavedancer Brill, and Recognition struck. Though the paranoid Wavedancer chief Surge resisted, Sunsteam brought the Palace to the sea-dwelling elf tribe and his bond with Brill was consummated. Their union resulted not only in the birth of their beloved daughter Korafay but also Sunstream’s gorgeously elaborate sea elf form, bestowed upon him through the collective powers of healers Leetah, Skimback and Snakeskin. 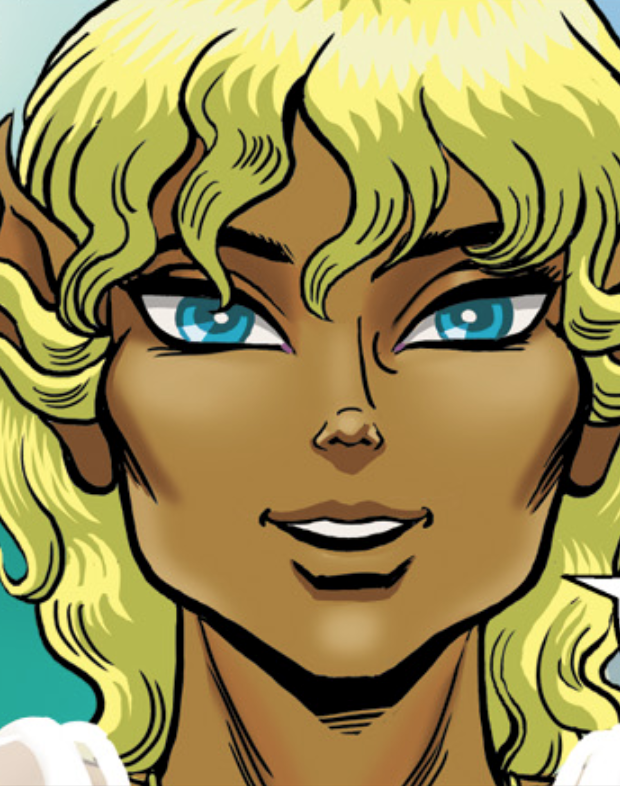 After spending a few decades with the Wavedancers raising Korafay into adulthood, Sunstream has returned to the Palace where he’s taken up his duty as the psychic stream through which all elves connect.